Finding Dory (2016) Rated PG | What to Watch. 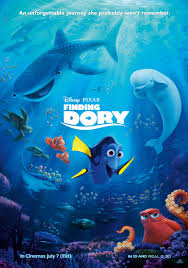 In this sequel to Finding Nemo, Dory, the blue tang fish, is looking for her parents. Starring Ellen DeGeneres, Albert Brooks, Ed O’Neill. This is another fantastic story by Disney. While out swimming along the reef one day, Dory remembers that she lost her parents as a child. Even with her short term memory loss, she is determined to find them again. Brilliantly written and delightfully entertaining, we follow Dory and her friends as she tries to remember clues from her past and find her way home again. The animation is absolutely fantastic both above and below the water; it is amazing how much technology has advanced in the past 13 years since Finding Nemo. This is a must-see film for young and old alike. This entry was posted in 2016, Adventure, Animation, comedy, Disney, family, films, Movie reviews, movies, Rated PG, reviews and tagged 13 years, adventures, Albert Brooks, animation, blue tang, Disney, Ed O'Neill, ellen degeneres, entertaining, film, film reviews, films, Finding Dory, finding nemo, fish, journey, loves, movie, movie reviews, movies, one, parents, past, sequel, story, trailer, water, worth, written. Bookmark the permalink. Pingback: People’s Choice Award Winners 2017 | What to Watch. Pingback: New This Week in Theaters, June 16, 2016 | What to Watch.